…even though when the air temp is 95 with a breeze it still makes for a bit of a bracer at the start. Glad to see you can order the new Dennis Wilson “Pacific Ocean Blue” legacy CD from Amazon.com. A re-release with bonus material of this fine album by the late Beach Boys drummer has been long overdue. Looks like the Patriots and the Saints did each other a favor with that swap of first-round picks in this past weekend’s NFL draft, enabling New Orleans to get the defensive tackle they wanted in Sedrick Ellis and New England going for mobility with inside linebacker Jerod Mayo. They say the best trades are the ones that help both teams; sounds like this might have been one of those. I wonder if Rob feels the same? Both Tracey and I give a big “thumbs up” for the new James Bond movie version of “Casino Royale”. Daniel Craig is a huge upgrade over Pierce Brosnan, and the overall film was a great improvement over the Brosnan vehicles, which were too violent for my taste. A “Happy Birthday!” to my bro Mark, who turns the big 5-0 today. Imagine that, one’s younder brother turning fifty. Sigh… Oh well, now he can (like me) know the joy of tossing all that AARP liberal/socialist agenda crap in the wastebasket. If you don’t believe me, check this out. In the spirit of Easteride, here’s an Here’s a very interesting story about the Irish love affair with Saint Padre Pio, whose exhumed body has been made available for public viewing in San Giovanni Rotondo, Italy. Colm Keane has written a new book that explores both this Irish love affair with this beloved saint of the Church and the various miracles that have been attributed to him. Looks to be an interesting read. The veneration of saints down through the ages has always involved a curious mix of faith and devotion mixed with marketing and capitalism; any read of church history will show numerous occurrences of this sort of thing since the earliest martyrdoms of its saints. Various Protestants may find this kind of thing amusing and worthy of scorn, but in my view it is surely no more worthy of scorn than their own repeated failures over the years to try and “get back” to the “original church” through their own schismatic actions, as if out of division you can make a whole. * If you’ve got farm animals and need hay, contact the Georgia Hay Girl. She says her customers are “Our customers are horses, llamas, goats, alpacas, cows, and a few other critters to numerous to name”, but I douby any of them carry credit cards on their person (or animal). * And there’s a redesigned Jerome Pascua weblog worth checking into from time to time. Jerome’s a very cool dude. * I’ve removed the Mirage Las Vegas link. For one thing, the Rio is (at least for now) official “Goodboys HQ” in Sin City. But more than that, methinks it’s near time for The Mirage (and, frankly, its official website) to get a complete makeover. * And I’ve removed Charles Johnson’s Little Green Footballs – too much negativity and cynicism going on over there for my taste. There’s already enough of that in the world without me having to to link to it. * These aren’t new additions to the Blogroll, but I highly recommend The Anchoress, Rob’s CrabAppleLane Blog, and Dave’s Fish Fear Me. Each are a regular part of my daily blogsphere wanderings. This is quite the amazing story. Given that the Goodboys are huge fans of “Jaws”, this will no doubt be cause for no small amount of interest ’round the ‘Nation. Several North County beaches were closed Friday morning after a man was killed in a shark attack north of Fletcher Cove, officials said. Witnesses told lifeguards that a â€œbig gray sharkâ€ attacked Martin, biting both his legs, said Solana Beach Marine Safety Capt. Craig Miller. Encinitas Lifeguard Lt. Paul Chapman, who went to Fletcher Cove after the attack, said the victim’s legs had suffered deep jagged lacerations, from the upper thighs to the lower shin, with a bite radius of about 22 inches. Chapman said that seals and sea lions have been beaching themselves in the area â€“ he said a crew from Sea World was on its way to rescue one as he spoke. Such beachings are a possible sign of a large predator in the coastal waters. Obviously it’s a tragic state of affairs for both Mr. Martin and the loved ones he has left behind – after all, what a horrible way to lose one’s life. But there’s another aspect to the story in that one can’t help but be totally amazed at God’s creation in all of its fascination and wonder – both good and bad – in the way we who dwell therein are impacted. Anyone picking up Griffith-Jones’ book might find it (as I did) incredibly frustrating; you just want the author to simply get to the damned freakin’ point. But that’s the whole idea at work here, for he has taken great pains to make sure his readers understand fully the context (not the theology) by which each of the four authors of the Gospels strove to write about Jesus in a way their target audiences would understand – after all, their communities were struggling (as each of us still are two thousand years later) to make sense of this extremely uncommon human being during difficult times. * For Mark, the critical point comes when, by tyhe tomb on Easter Sunday, the angel instructs the women to “tell his disciples and Peter, ‘He is going before you to Galilee; there you will see him, as he told you. '” (Mark 16:7) For Mark’s readers the instruction is clear – if you want to know about the Risen Lord, go back to the beginning, where at the start of Mark’s Gospel you have Jesus’ first appearance and his calling to Peter. * For Luke, the beginning lies in the opening of the disciples’ minds and understanding that first Easter night when he appeared to those gathered and “opened their minds to understand the Scriptures”. So what does all this have to do with dawn breaking over my “Marblehead”? Simply put, I don’t think I every truly understood – or maybe I did understand but never took it seriously enough – the whole idea is that to walk with Jesus requires a new beginning, a desire to allow the Holy Spirit to bring about a new creation in each one’s own self. Being the stubborn guy I am, I’m all too aware that I’ve always resisted God’s calling to give up any more of myself than I’m comfortable with – like most people, I guess, there’s a bit of ego and a fear of the unknown going on there. Even given the flaws in Griffith-Jones’ book (and there are many, not the least bit being a disturbing – and in my view, unnecessary – lack of bibliography), what he has succeeded in doing was pulling together the various strains and contexts by which Jesus’ life and teachings were documented, communicated, translated, and lived by those who followed him (both figuratively and literally) in those early and formative years of the early Church and chip away at that wall of ego and will I’m so protective of. After all, it’s not just a change in head and heart that God is seeking from each of us, but behavior as well. One would think behavior would follow (at least in some regard) head and heart, but I just sense that God doesn’t want just 80 or 90 percent of me, he wants all of me. Now to find the courage and will to let Him both take it and have at it. Whirlpool suspends 39 workers for not admitting they were smokers. Yeah, that sounds about right – I’d rather have crappy non-smoking workers than hard-working smokers. Talk about a world gone mad. Time for ALL employers to get out of the health-care providing business. The first “World’s Largest Snow Plow Parade”. After this winter, I think the folks in Northern Maine deserve a little fun, don’t you? I live amongst idiots. So those mysterious UFO lights over northern Phoenix were a hoax? Wow. Who could have ever thought that? …continuing my list of the seven wonders of The Great White Shank’s musical world, it’s Christmas in April! Laugh all you want, but Phil Spector’s “A Christmas Gift For You” is a must-have for yours truly were I ever stranded on some desert island. No need to create a new post about this. All that needs to be said has already been said – all you have to do is click this link. Over the past few weeks I’ve been tweaking my “Flower Power” collection big time, to the point where I have it EXACTLY the way I want. So, for posterity’s sake (and for all you audiophiles out there) here is my original 6-disc set with the subsequent changes made – and believe me, there isn’t a slouch cut in this set. I challenge anyone to find any weaknesses in it! Just remembering the events of a year ago. We lit candles, said prayers, and even planted a cactus out front of our house in memory of our beloved rabbit Marble. But the sting of his loss remains acute a year after he departed this earthly life. 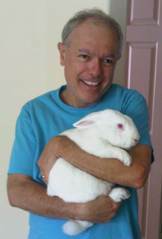 For me, he was a great rabbit, but nevertheless a pet. To Tracey, however – well, let it just be said that she and Marble were more than that; they were soul mates (if such a thing were possible between human and rabbit). And in Tracey and Marble’s case, I believe it was – for they had a special relationship that transcended understanding from the very start (after all, he picked her out, not vice-versa), and the bond they shared from that moment was something quite extraordinary to behold, and precious. So isn’t it interesting that a strange thing happened today? But before I pass this along, let me say this: I am not a believer in coincidence. Last night, just around the time Marble died at the vet a year ago, we were blessed with the arrival of four yellow butterflys that chose our backyard to hunker down for the night. This by itself would be pretty extraordinary all in itself (if you ask me), but the way they did so was both very cool and worth mentioning – for the four of them settled down on the grass in front of our mesquite tree the shape of a cross. Was Marble perhaps was trying to tell us something – something we already knew? That true love (whatever form that might take) is a gift from God not restricted to only human beings, and something that lasts forever? …continuing my list of the seven wonders of The Great White Shank’s musical world, without a doubt I would have to include The Chambers Brothers’ “Time Has Come Today”. What is it that makes it one of the seven wonders? Original. Completely psychedelic. Lots of distorted guitar. Echo and reverberation everywhere. Backwards recorded stuff. That damned cowbell. All very ’60s. And all very much what The Great White Shank finds intriguing and alluring beyond all measure. Simply put, there is no other song like it. If you want to take a totally far-out trip back into the late ’60s, you can do no better than “Time Has Come Today”. Crank it up, man. VERY loud. Then disappear into yourself. Dance around the room. Embarass yourself before your family and neighbors. Feel the joy and find your own space. Groovy.